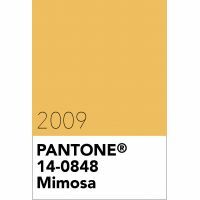 The colour yellow exemplifies the warmth and nurturing quality of the sun as we humans are naturally drawn to it; and the Pantone colour of the year for 2009 Mimosa Yellow is a hue that uses this reassurance to spark imagination and innovation. Best illustrated by the abundant flowers of the Mimosa tree, Pantone 14-0848 Mimosa represents the hopeful and radiant characteristics associated with yellow. Pantone Mimosa is a versatile shade that coordinates with any other colour and translates to both fashion and interiors. Pantone 14-0848 Mimosa is from the Pantone Fashion, Home + Interiors colour library.